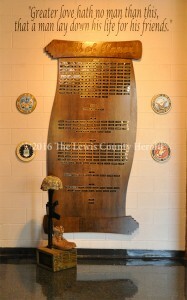 A project to honor Lewis County veterans has been completed at Lewis County High School in time for the annual Veteran’s Day Ceremony at the facility. Friday’s annual event will begin with a video tribute to local veterans beginning at 9:25 a.m. in the LCHS Auditorium. The ceremony will begin at 10:20 a.m.
LCHS Principal Jack Lykins said the latest project to honor veterans was developed several weeks ago when he saw a tribute wall while visiting a school in another district. “I thought it was a great way to honor our local service men and women who have gone to war and didn’t come back,” Lykins said. The tribute wall is located in the lobby at LCHS at the entrance to the auditorium. Lykins said Northern Contours contributed many of the materials and assisted in creating the tribute piece. “MSgt. Stone spent many hours on this project and I appreciate the effort he put into this project,” Lykins said.